A recent study reported in Jezebel (http://jezebel.com/5826180/these-kids-today-sure-do-love-their-stayover-relationships) defines a new type of relationship: the stay over. Couples in the stay-over relationships spend most night together but maintain separate residences. Tyler Jamison of the University of Missouri has been studying this trend, especially among people in their 20s. “This seems to be a pretty stable and convenient middle ground between casual dating and more formal commitments like living together and getting married,” she says in an article in Journal of Social and Personal Relationships. Jamison suggests that this type of relationship postpones making a commitment to a more permanent relationship while each partner pursues other educational or occupational goals. This situation reminds me of the posited existence of what was referred to a number of years ago as the Peter Pan complex: a condition particular to males who refused to grow up and who therefore, would not commit themselves to a serious relationship. At the time this complex was ascribed mostly to men, but it seems to have now spread to females as well, albeit under a different name. Of course, I am not certain that this type of relationship is at all new: I cannot help thinking of Jean-Paul Sartre and Simone de Beauvoir whose long term relationship seemed to be of the stay over variety, though I think they might have defined their motives differently. I do not think theirs was an isolated case. 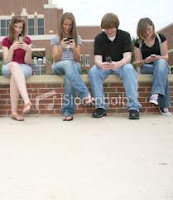 But if I were a sociologist I would be interested in studying the connection between what is termed the greater occurrences of the stay-over relationship and the ubiquitous use of mobile devices and the social media device, Facebook. I believe that the definition of relationship is changed by the availability of these media. It is a rare sight to see a person in their thirties or younger without a cell phone in hand; and it has become veritably impossible to find such a person failing to regularly check the device for incoming text messages. Having received such a message, the person responds to it immediately regardless of the activity in which s/he happens to me immediately engaged and despite the company with whom he/she might be with at the moment. People text constantly, and I think it is a means of remaining distracted and not having to engage in the immediate. All uncomfortable situations are alleviated by the availability of texting: one can easily disappear from the contemporaneous by texting the remote. I know: I have two daughters in their twenties and teens. Lately, they are never fully present, they are always talking to someone else. Texting, the gerund, is a ubiquitous practice: even movie theaters request that viewers refrain from texting during the movie!! The practice suggests that those engaged in it are never wholly present: they are always somewhere else and in the company of another who is not here. At best, engaged in texting they are distracted; it is not who they are with that is central but who else with they could be talking. Attention cannot be paid because they are always not wholly present to attend, and engaged in texting such individuals communicate to those immediately about them how only partially and temporarily available they presently are. Much conversation and potential intimacy may be avoided by such practices. Now, over my years I have noticed that conversation amongst friends and acquaintances takes place in a certain pattern, or rhythm. Usually such exchanges begin with some small, casual talk and they move smoothly, almost organically into discussions of more serious and intimate matters. Talk about the especially uncomfortable weather turns to talk and analysis of the uncomfortable political situation that transforms into conversation about the difficulties and complexities of relationships and self. Intimacies deepen. The intensities of such conversation require some respite, and then, perhaps with a joke or casual remark of self-deprecation, the conversation floats with some relief back to the surface, , and the pattern begins again. But on Facebook individuals engage in all of the small talk that precedes and opens the way for more serious and intimate conversation, and therefore, when people meet, there is no news to tell you, Horatio, and conversation never quite begins. The ubiquity of Facebook, now also accessible on mobile devices, means that all small talk may take place without personal contact; there exists nothing to ease the way to more intimate conversation. Each individual texts someone else to fill the uncomfortable silence produced from having nothing to report. I mean, even therapy sessions begin “Well, what is going on?” But Facebook means that everyone always knows what is going on and there is nothing new to report. No place to begin. The stay-over relationship appears part of this movement away from intimacy and presence. Such arrangement seems not about deciding where to be but about where else to be.